Who wouldn’t like AppCatalyst? People with out a Mac, or people running Windows VMs. For that audience there is still VMware Workstation, Fusion and other virtualization alternatives. If your still with me, then download the hotness from…. VM’s Phssssshhhha! How do I make it useful for development? I’ll skip the usual unzip instructions as many other blogs have covered the basic install. The remainder will focus on how to integrate AppCatalyst into your development environment using Vagrant and an IDE, in my case it’s IntelliJ, the result will be a simple NodeJS application. I’m talking third platform apps, not your local alley bar. AppCatalyst is packaged with project Photon, a container run time host. I won’t go through the vagrant install process. It’s easy and well documented on the internet. Install the AppCatalyst plugin for vagrant. I’m also using project Photon as the container host. There is a vagrant plugin for photon too! Install the photon plugin for vagrant. SED_NEW="ExecStart\\=\\/bin\\/docker \\-d \\-s overlay \\-\\-tlsverify \\-\\-tlscacert\\=\\/etc\\/ssl\\/certs\\/ca\\.pem \\-\\-tlscert\\=\\/etc\\/ssl\\/certs\\/server\\-cert\\.pem \\-\\-tlskey\\=\\/etc\\/ssl\\/certs\\/server\\-key\\.pem \\--host 0\\.0\\.0\\.0\\:2376"
Dont’ worry about copying and pasting. I’ve setup a github project for this work. Feel free to clone the project to your desktop. The project can be found at https://github.com/inkysea/node-appcatalyst. The project as three key items for review. VagrantFile : This is a configuration script for vagrant. Vagrant will work with AppCatalyst to magically provision a photon instance, complete with docker daemon and SSL certs so you can communicate remotely with docker. 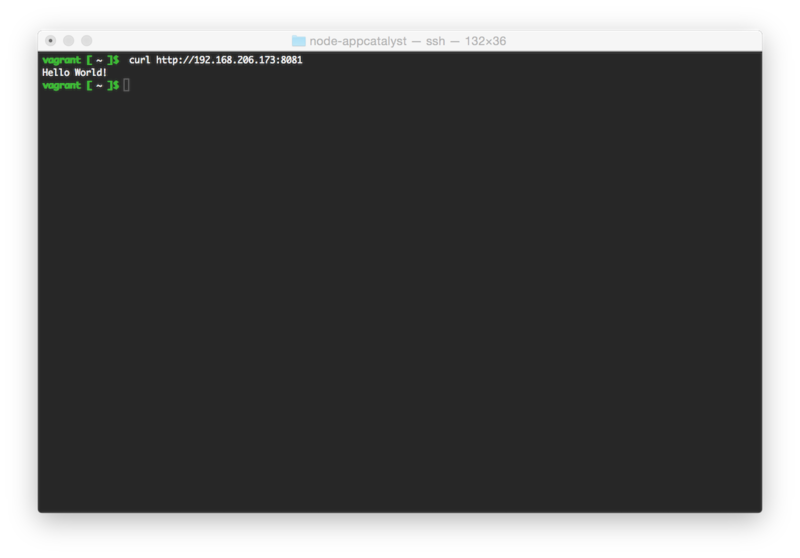 Simply type “vagrant up” from the command line and watch the magic! DockerSettings directory : Contains a configuration file for docker, container_settings.json. 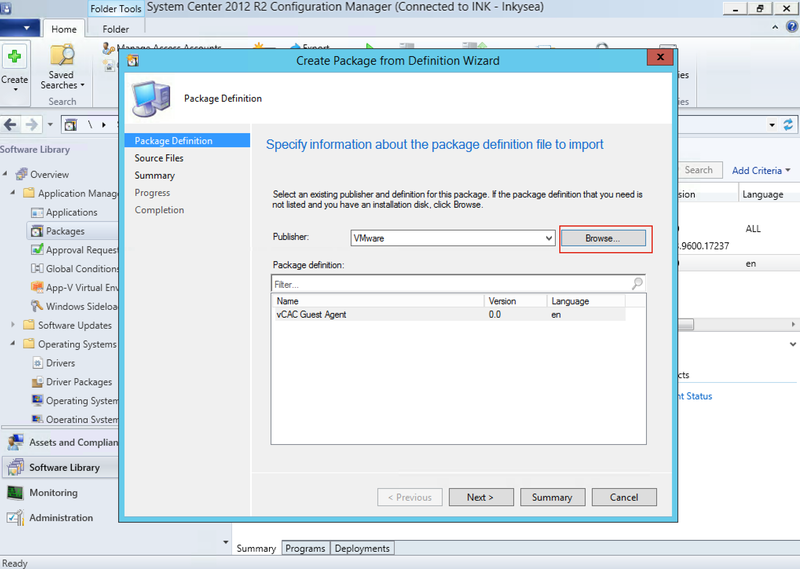 The configuration file sets values such as listening port, volumes, etc. The file is used at build time and is useful for times when you don’t use ‘docker run’, like with an IDE. DockerOut Directory : Contains DockerFile, .dockerignore and sample nodeJS code. A. The DockerFile instructs Docker on what to run and install. The included docker file is installing NPM and some other dependencies for a nodeJS app. # Execute nodemon on the /app/index.js file. nodemon will poll the file for updates. B. The .dockerignore file is incredibly important if you don’t want docker to fall over after running a couple of containers. The file works similar to .gitignore but for docker, essentially defining files and directories that should not be placed into the container. In this example, the node_modules directory is ignored as it can get huge and has no business making it into your container. C. index.js is your “hello world” node JS application. Now you are ready to run docker on that fancy photon VM you provisioned earlier with Vagrant and AppCatalyst. 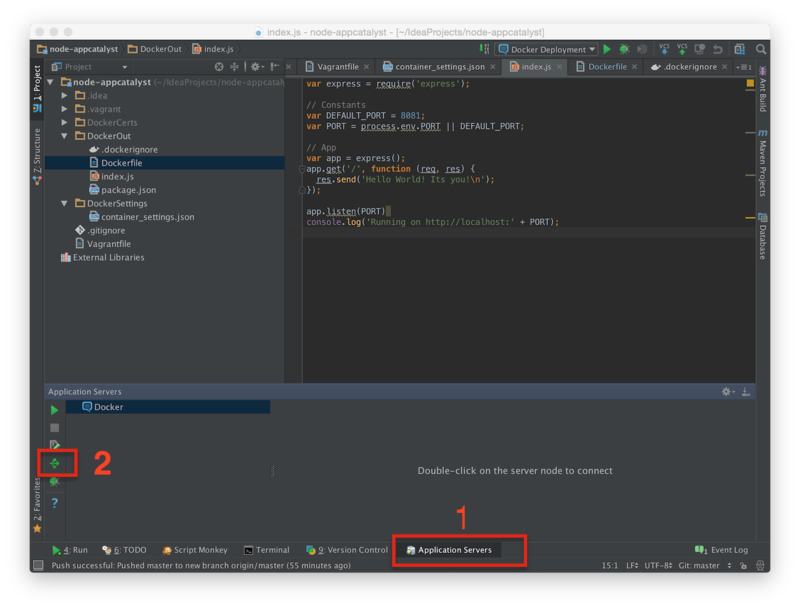 You can run your container using the command line or using an IDE like IntelliJ. You can setup IntelliJ with the Docker SSL certs that were created by Vagrant earlier. 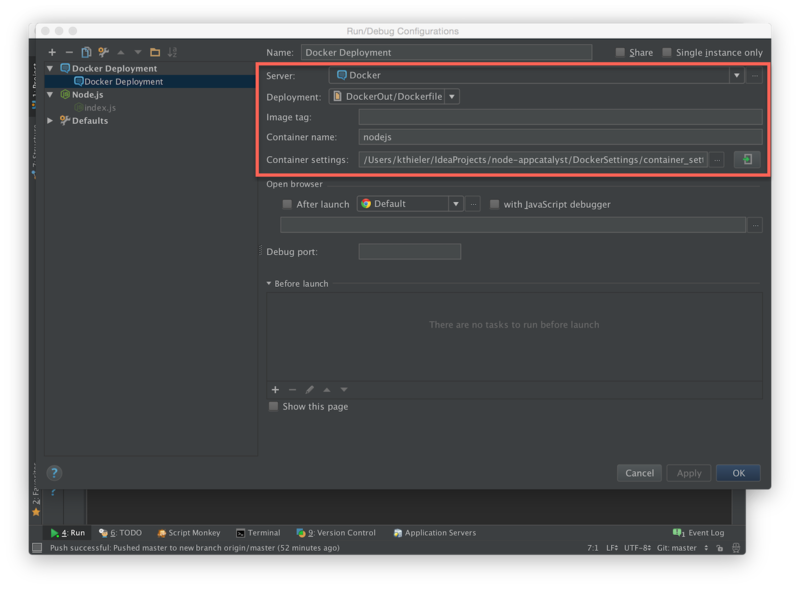 Configure IntelliJ for Docker’s API. Set the API URL and the Certificates Folder. The API URL will be the IP of your vagrant VM and the docker API listening on 2376. The Certificates required for communicating docker are in your projects directory under DockerCerts, they were created by the VagrantFile. 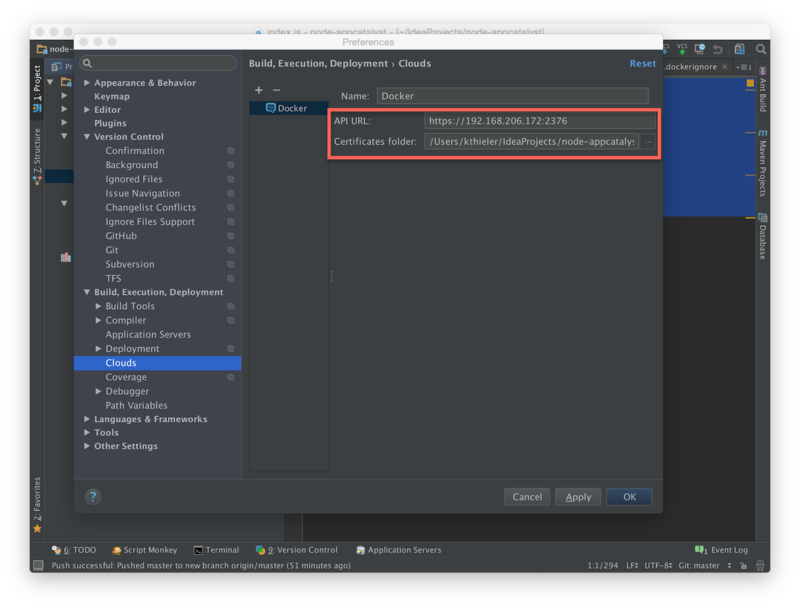 Configure IntelliJ to run docker. Navigate to “run” -> “edit configurations” and add a “Docker Deployment”. Deploy your application into a container. 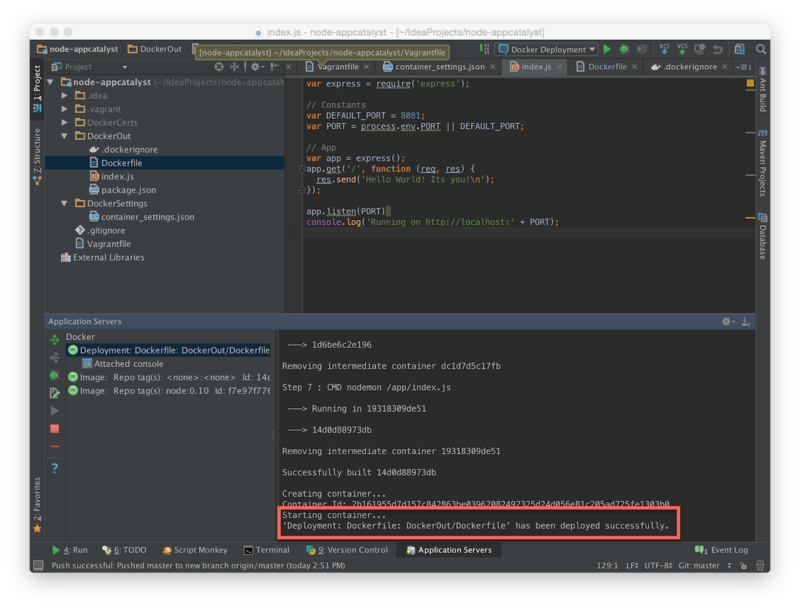 1. navigating to the “Application Servers” tab on the bottom right of intelliJ. 2. Press the deploy button. When docker is done, you will see the following message stating that the container has successfully deployed. You can now browse to the IP and Port (http://vagrantIP:8081) of your container to see the hello world message. Note: The ability to use code injection for nodeJS with nodemon is very desirable as you can simply update your code and see real time results as it is mapped into the container. Unfortunately, I haven’t found a way to make this work with the container_settings.json. In theory you should be able to map a volume in the container settings similar to ‘docker run -v’. If you want to use code injection then you are stuck using docker run -v at this time. Managing workload on-premise or on a public cloud? No Sweat! Recently I was challenged with provisioning an application to both an on-premise cloud and a public cloud. In this example, the on-premise cloud is powered by vSphere and the the public cloud is AWS EC2. 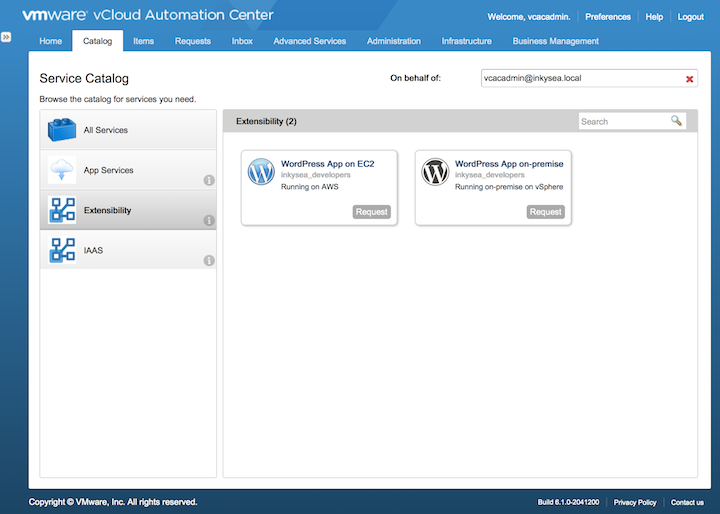 I’ll demonstrate how vRealize Automation abstracts both clouds and allows you to easily deploy a simple application (WordPress App) using extensibility with vRealize Orchestrator. First setup machine blueprints for both your on-premise vSphere workload and your AWS EC2 workload. The blueprints should leverage the same version of OS to make things simple. Go to the infrastructure tab, navigate to blueprints and select “new blueprint”. You’ll be able to choose from several different clouds and on-premise options. 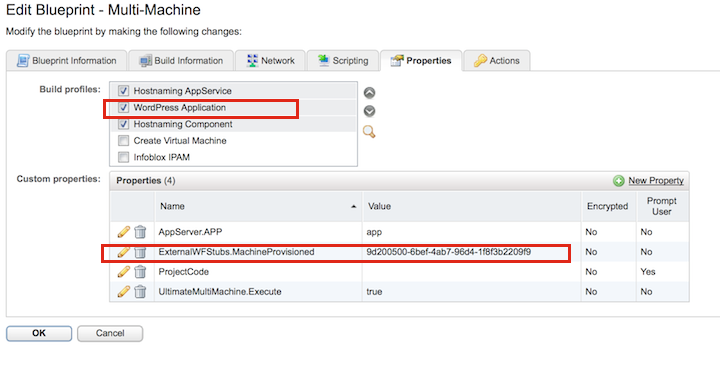 In this example, I’ll leverage the multi-machine blueprints to create an application based on pre-existing single machine blueprints for Linux on vSphere and EC2. 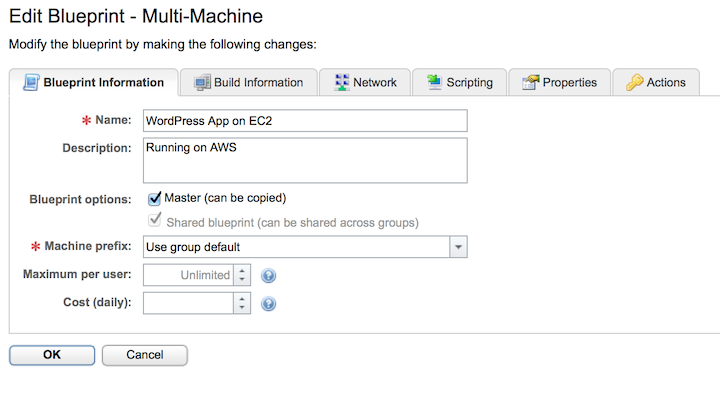 Creating the multi-machine blueprint for both vSphere and EC2 is pretty much identical. Ensure that you provide a descriptive name and description. Now specify the single machine blueprints to be used in the “Build Information” tab and select “Add Blueprints”. You’ll be provided with a list of single machine blueprints that can be added. Note that I pick the single machine blueprint CentOS Linux 5.6 running on EC2. If I was creating an on-premise blueprint I’d choose the linux blueprint just below. Now that my single machine blueprint has been added, I’ll set the maximum lease for 2 days. Since this is running on EC2 I want to control how long the workload can run to avoid costs. Finally, I’ll add properties that are required to deploy the WordPress application. 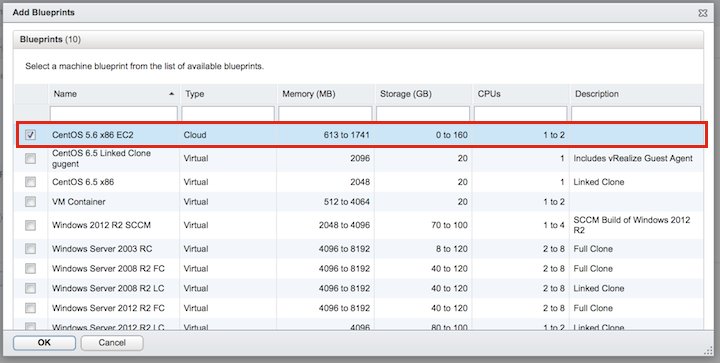 Note that the properties are identically, regardless of running on vSphere or EC2. 1. I am leveraging build profiles to contain certain wordpress properties like DB name, password, etc. A build profile essentially allows you to create a group of properties that can be easily reused across blueprints. I’ve named the build profile “WordPress Application” and checked it so that those properties are included in the blueprint. 2. I’m leveraging vRO extensibility to run a custom workflow that will execute on the linux machines and install the word press application. 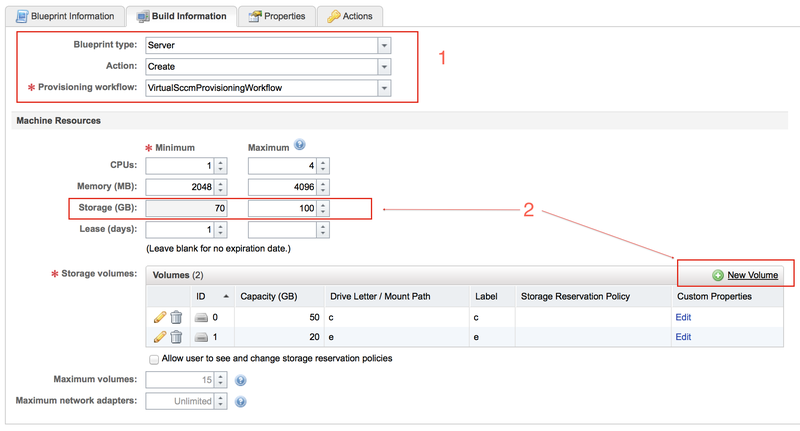 The property “ExternalWFStubs.MachineProvisioned” is used to tell the blueprint to run a vRO workflow once the machines are provisioned in vsphere or EC2. The unique ID of the workflow is 9d200500-6bef-4ab7-96d4-1f8f3b2209f9. How do you guet the unique ID of a vRO workflow? Simply log into vRO, find your workflow and look at the “General” tab. The unique ID of the workflow will be displayed. Since we are deploying to a consistent version of linux, A single workflow can be utilized to deploy wordpress on-premise or on EC2. There is one logic point that should be added to your workflow to decide if the workflow is running on an vSphere or EC2. In the screenshot below, you’ll notice that I highlighted a custom decision point. The following code is in the decision point. If it’s running on EC2 it will direct the workflow down a path that uses the DNSname if it’s running in my on-premise cloud then it will use the IP address. At this point we have a blueprint and a vRO workflow for deploying the wordpress application. After publishing the blueprints for on-premise and EC2 it’s now available for my users to consume. 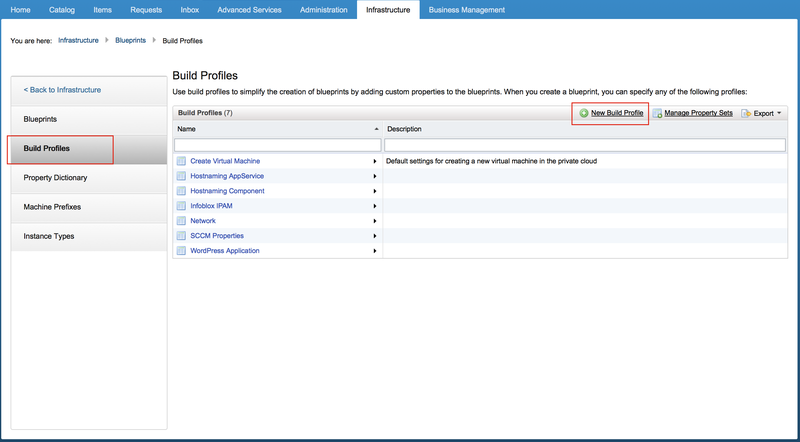 With vRealize Automation (vCAC) 6.1 you can call REST API’s to request services. 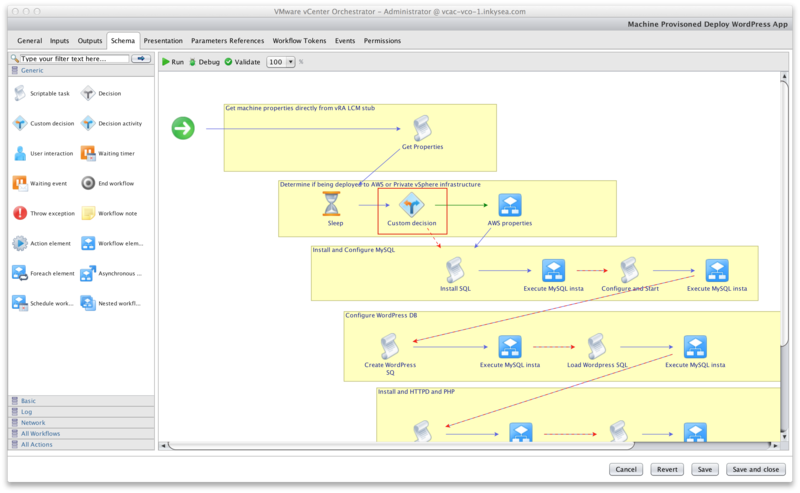 With a REST API you can easily introduce vRealize Automation into a continuous delivery pipeline with your favorite continuous integration tool, like Jenkins. I’ll cover how to manage a simple machine lifecycle (provision and destroy) using the REST API. There are several options for REST clients. REST simply sits over the HTTP protocol. You can even use a command line utility like curl to make REST calls. To demonstrate vRealize Automation’s REST API I’m using a Firefox plugin called RESTClient. You must set your HTTP headers, regardless of the REST client. The steps are slightly different for each client. 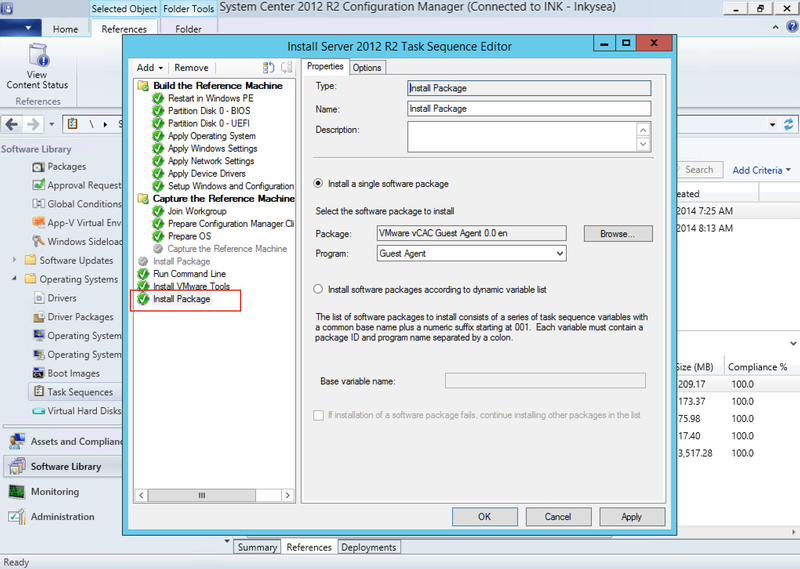 For the RESTClient select the “Headers” menu item and then select “Customer Header”. You’ll enter two headers. Save each header to your favorites and apply each header. The body is a simple JSON string which includes the user, password and tenant. Select send and you will now see a response from the server that includes your token! You’ve got a golden ticket! Now lets order a VM! 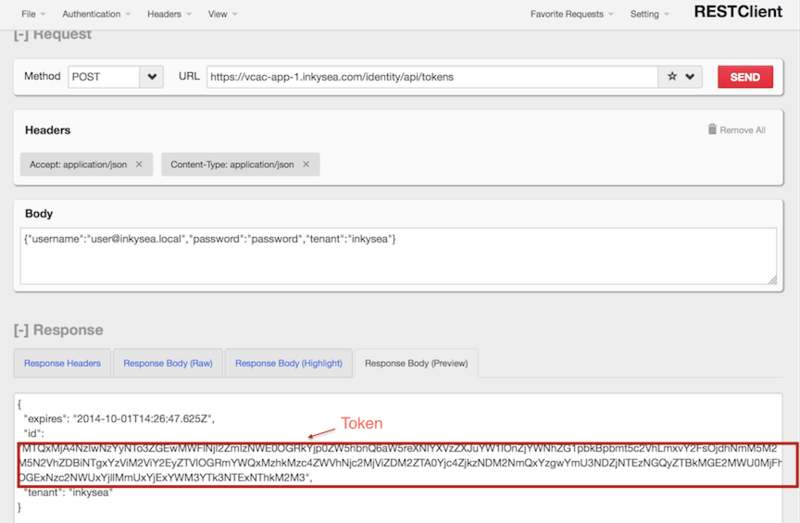 You’ll use the token as an HTTP header for the remainder of your session. Note that the default session timeout for a token is 24 hours. to the /etc/vcac/security.properties file. Note that N is equal to number of hours. You need a list of services to which you are entitled, like ordering a VM. Once you get the list you’ll be able to choose the services that you want to order. Note that you are interested in the “id” and the “bindingID” that are in bold font. Save those ID’s for later! You’ll need the ID to order the service! I order you to give me a VM! At this point you are ready to order a VM. Let’s recap the values we’ll need to place the order over REST. JSON Body: Replace the values in bold with values that pertain to your environment. 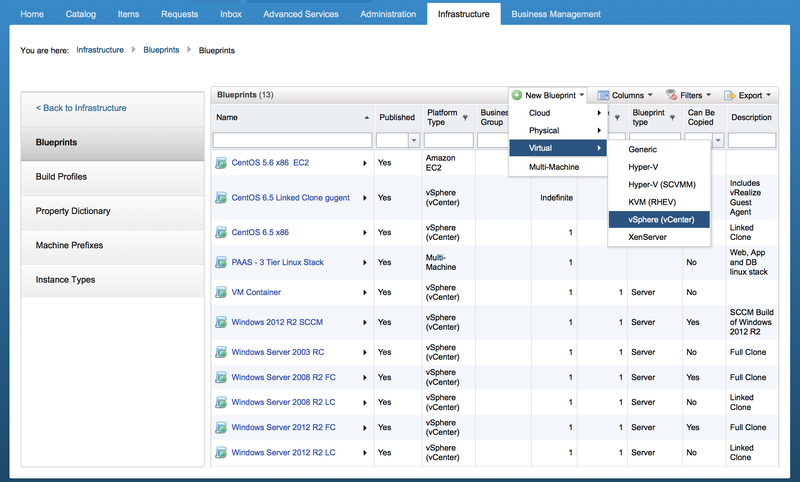 Inside the vRealize Automation portal you now see your VM request! At this point we’ve ordered a VM and we have the request ID. 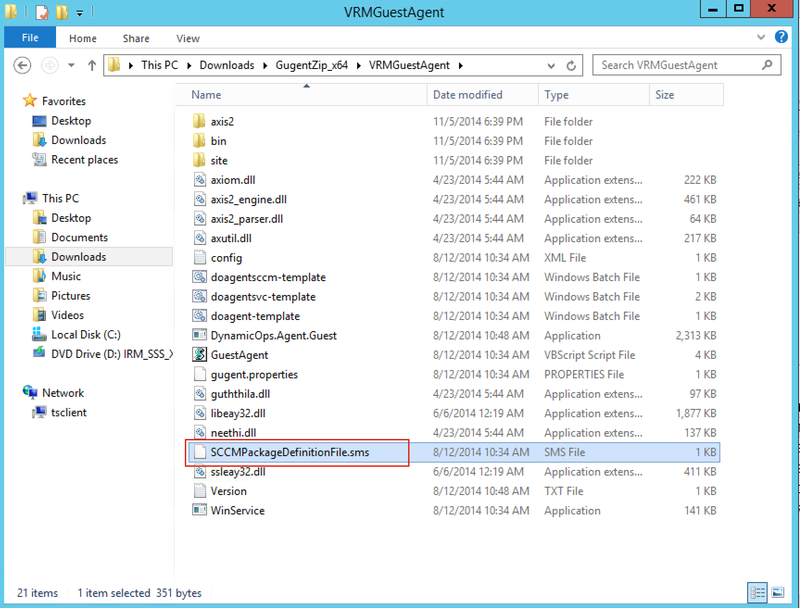 You can now search for the ID of the VM that you provisioned by using the request ID. There are two items you’ll need from the JSON response. I’ve highlighted them both in bold black text in the JSON response above. Note: It is possible to filter the results based on ID. Filtering will limit the content returned in the JSON response.